1. 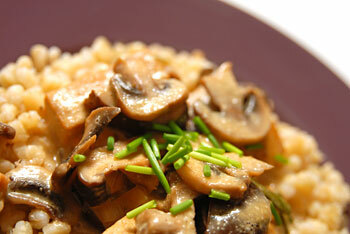 Put shiitake mushrooms and boiling water in a small bowl, cover, and set aside. After several hours , squeeze liquid out of soaked mushrooms; reserve soaking water. Cut off and discard tough stems. Slice caps as thin as possible. 2. Place tofu, salt lemon juice, oil and tahini in a blender or food processor. Blend until smooth and set aside. 3. Heat water or sesame oil in a large nonstick skillet. Add onion; sauté over moderate heat until almost tender. Add sliced shiitakes, white mushrooms, pepper and paprika. Sauté until white mushrooms no longer appear dry. 4. Add 6 tablespoons reserved mushroom-soaking liquid to skillet, plus wine and soy sauce, cover and cook over low heat for 5 min., until mushrooms are tender and flavors are melded. 5. Stir thyme, dill and tofu mixture into skillet. Cook briefly until slightly thickened. 6. Serve over noodles or rice. Garnish with parsley and additional paprika if desired.